To effectively, efficiently, and equitably respond to climate change, countries must develop gender-responsive mitigation and adaptation strategies—not least because women are among those disproportionately and adversely affected by climate change and are seldom included in relevant decision-making processes to identify and implement solutions. 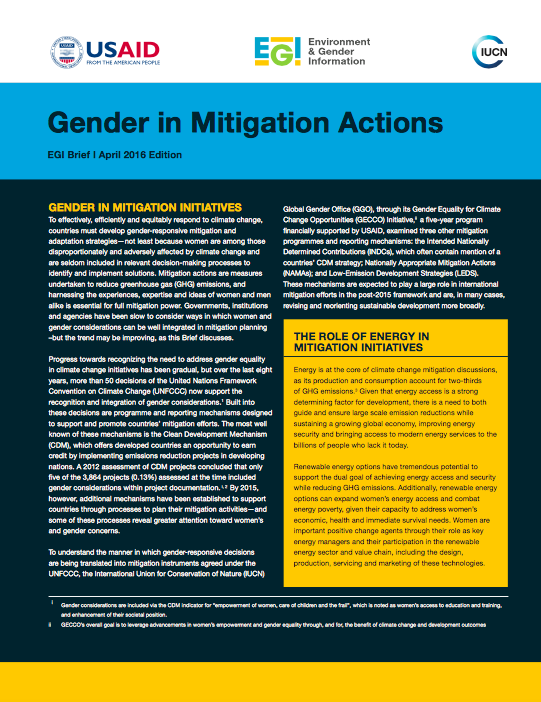 Mitigation actions are measures undertaken to reduce greenhouse gas (GHG) emissions, and harnessing the experiences, expertise, and ideas of women and men alike is essential for full mitigation power. Governments, institutions and agencies have been slow to consider ways in which women and gender considerations can be well integrated in mitigation planning –but the trend may be improving, as this Brief discusses.